FindFreeForms is your destination for free forms you can use to organize your home and your life. (The forms here are primarily non-business forms.) Browse through the categories below to save time and spur ideas. If you are interested strictly in free business forms, check out our sister site, Formville, for thousands of forms. Be notified whenever new forms are added to FindFreeForms. Enter your address and click "Subscribe." Form Description: It can be just as important for you to keep track of your own medication needs, as it is for a doctor or nurse to. If you find that you need to do that for yourself or a member of your family, make sure that you use this Simple Daily Medications Log to keep track of that information. By keeping this log, you can easily let your personal physician know whether, and when, you are taking your proper medications. See the actual form further down this page. 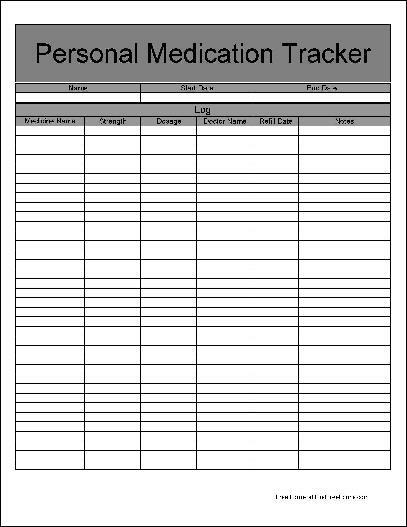 This form ("Basic Simple Daily Medications Log") is associated with the following keywords: personal, medical, medicine, log, tracking, history, basic. FindFreeForms is a service of Sharon Parq Associates, Inc. Copyright © 2019 by Sharon Parq Associates, Inc.